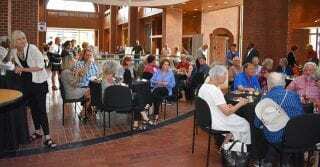 OLLI members and guests enjoy refreshments and speakers during last year’s open house. 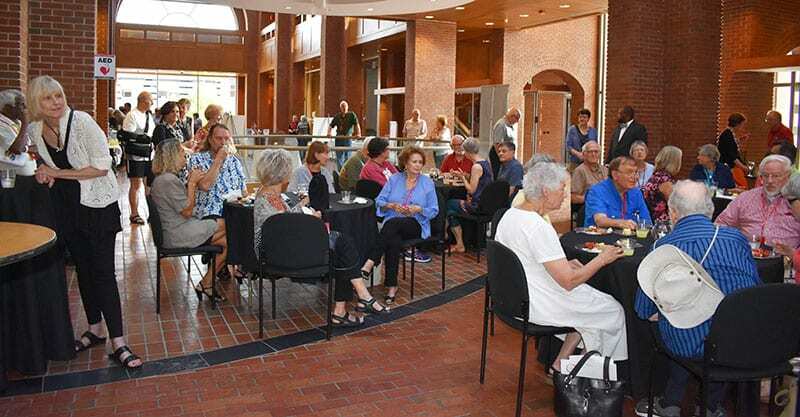 The Osher Lifelong Learning Institute will hold its fall open house this week to show off its new space, celebrate successes of the past year and announce a new partnership. The open house will take place from 4:30 to 6:30 p.m. Friday, Aug. 31 at 211 E. Dickson St., the new home of the OLLI offices. Online reservations are requested. The Osher Lifelong Learning Institute, a service unit of the College of Education and Health Professions, was established at the University of Arkansas in 2007 through an endowed gift from the Bernard Osher Foundation. The mission of the Osher Lifelong Learning Institute at the U of A is to provide a community of seasoned adults with a lifelong learning venue that promotes intellectual vitality through exploration and discussion via diverse, high quality and affordable educational programs. OLLI programs are tailored to mature adults; however, there are no age restrictions or academic prerequisites. Memberships can be purchased online or at the open house. Members and guests can see the new office space in what was formerly the Roberta Fulbright Library, learn about fall programs and events and visit with instructors about their courses. Refreshments will be provided. The organization is also celebrating several successes. In July, it was awarded a second-year $25,000 grant from the Osher Foundation for achieving 10 percent growth in membership and setting benchmarks with fundraising efforts. OLLI has more than 600 members and course enrollment topped 2,200 for the fiscal year that ended June 30. OLLI also has established a new partnership to hold a series of courses at the David and Barbara Pryor Center for Arkansas Oral and Visual History, 1 East Center St., Suite 216, Fayetteville. Classes there will cover such topics as higher education fundraising, writing, Ozark culinary history and Scottish poet Robert Burns. “Fulbright College became the new home of the Pryor Center in 2017 and with this move came an expanded mission in education, research and outreach,” said Bill Schwab, director of the Pryor Center and a professor of sociology in the J. William Fulbright College of Arts and Sciences. “OLLI is one of our first partners in this new venture and we relish our future collaborative programs. OLLI is seeking both current and retired U of A faculty and staff members to teach OLLI courses in their area of expertise or a hobby about which they are passionate. Offerings include one-time lectures, multi-session programs, a luncheon series called “dine and discover,” field trips called “out and about,” study groups and workshops. The deadline to submit a course proposal is Oct. 30. Courses cover a wide range of interests including Babylonian mythology, making fresh pasta, World War I, digital photography, doll-making, bird song, and sexuality and relationship education for adults. Several are hikes in beautiful places of Northwest Arkansas.